This is the 2nd Rounder label CD of Alex Francis accompanied on piano by Gordon MacLean. 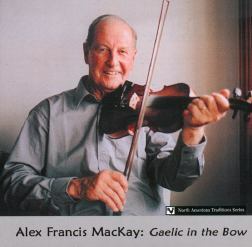 Alex Francis learned music in a household of Gaelic speakers. Although his repertoire is mainly 18th and 19th century Scottish music, in his formative years he also learned tunes from two of 20th century Cape Breton's most influential composers -his cousin, the legendary composer Dan R. MacDonald and from Queensville neighbour Dan Hughie MacEachern. 1. i. Jeannie Carruthers -- march (John MacColl), ii. Lady Madelina Sinclair -- strathspey (Niel Gow), iii. Mr. Compton of Compton Hall - reel. 3. i. Glengrant (J.S.Skinner), ii. Mr. Eager's (Jos. Lowe) -- strathspeys, iii. Thrum's Cairn (J. Scott Skinner), iv. The Yetts of Muckart (J.S. Robertson) -- reels. 4. i. Memories of Joe MacInnis (Dan. R. MacDonald, SOCAN) -- marching air, ii. The Lorn Strathspey (Niel Gow), iii. Lassie Look Before You (Wm. Marshall) -- strathspeys, iv. The Lasses of Stewarton, v. Geordie MacLeish -- reels.